2015 was the warmest year on record. Are you worried about climate change yet? If so, you might want to attend Dr. Gary Lagerloef’s upcoming presentation “Climate Science in the Space Age – an Update” for Open Mic Science Night at the Treehouse Cafe, Monday March 7 at 8 PM. Listen here as Dr. Lagerloef, senior scientist at Earth and Space Research, talks with BCB host Sonia Scaer about his climate research. Dr. Lagerloef began his career in oceanography as an undergraduate, completed a Ph.D. in Physical Oceanography at the University of Washington in 1984, and later worked in private sector marine science. From 1988-1990, he served as Physical Oceanography Program Manager at NASA in Washington DC in the ocean science remote sensing program. 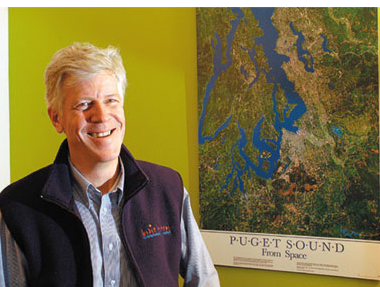 In 1995, he co-founded Earth and Space Research, a non-profit scientific research institute in Seattle where he has developed several research projects devoted to studies of the upper ocean dynamics and climate variability using satellites. For more details about Earth & Space Research visit the website at https://www.esr.org/aquarius_index.html. Credits: BCB host: Sonia Scaer; BCB audio editor: Chris Walker; social media publishers: Chris and Diane Walker.